This bead has a base of transparent ocean blue with blue dichroic. 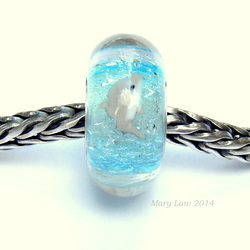 Three grey and white dolphins are swimming through a sparkling blue ocean. Measurements are approx. 15 mm in diameter, 7 mm wide and the bead hole is 4.5mm and has been tested to fit on my pandora bracelet. It will fit on Pandora Trollbead, biagi, and Chamilia bracelets and necklaces. studio. I love making these beads and sharing them with you and this is an exceptional bead. are processed through secure paypal link below. Sold - Purchase is for the bead only - Bracelet is not included. 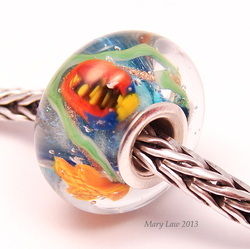 This bead has a base of transparent ocean blue with blue dichroic. A large purple Seahorse, blue starfish, Sand dollar, and orange Starfish are in this bead. Trollbead, biagi, and Chamilia bracelets and necklaces. Email me at mclsra87@gmail.com with any questions.Payments are processed through secure paypal link below. 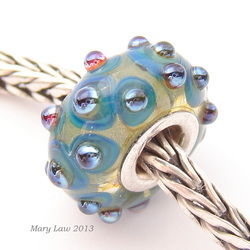 This bead has a base of transparent green with layered dots of blue, green and a shiny silvered glass. Measurements are approx. 15 mm in diameter, 7 mm wide and the bead hole is 4.5mm and has been tested to fit on my pandora bracelet. It will fit on Pandora Trollbead, biagi, and Chamilia bracelets and necklaces. love making these beads and sharing them with you and this is an exceptional bead. Purchase is for the bead only - Bracelet is not included. 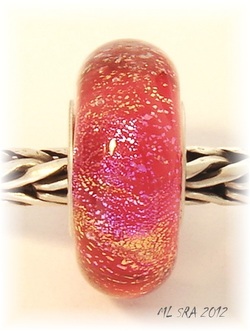 This bead has a hot pink glass base with sparkling magenta dichroic and has been encased to add depth and dimension. Measurements are approx. 14.5mm in diameter, 6.5mm wide and the bead hole is 4.5mm and has been tested to fit on my pandora bracelet. It will fit on Pandora Trollbead, biagi, and Chamilia bracelets and necklaces. A solid sterling silver tubing core has been custom cut, filed, and pressed all by hand in my own studio. I love making these beads and sharing them with you and this is an exceptional bead. Email me at silver@myfairpoint.net with any questions.Payments are processed through secure paypal link below. and has been encased to add depth and dimension. Measurements are approx. questions.Payments are processed through secure paypal link below. A stunning bead with a tropical fish, starfish and sanddollar over green and gold vines and a sparkling blue dichroic base. Encased with crystal clear for a deep magnification.. Measures 15 mm by 8.5 mm and it will fit on Pandora, Trollbead, Biagi, and Chamilia bracelets and necklaces. Sold - Purchase is for bead only Trollbead bracelet is not included. 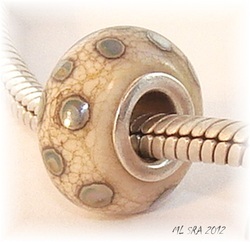 An Organic Ivory Dot bead that is started with a base of dark ivory glass that has fine silver leaf mixed within the glass which causes the crackle effect. 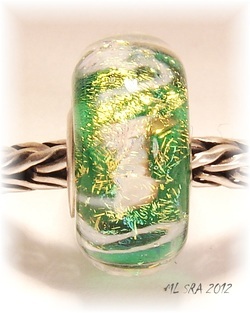 Dots of a specialty silvered glass are reduced to a silvery sheen to finish off this unique bead. This is a very nice smaller size bead - perfect for troll beads and all the other bracelets. Measures 15 mm by 8 mm and it will fit on Pandora, Trollbead, Biagi, and Chamilia bracelets and necklaces. Email with any questions.Payments are processed through secure paypal link below.